How the dream of a historical country estate finally became reality after a long search. For ten years Ilona and I have had a dream: we dreamt of a historic building, a traditional country estate where people could come and be refreshed and rest. Our search began. On the internet we found a photo that expressed our longing: a country estate with a rose garden. This picture became a ‚goal photo‘ for our dream, which we showed to our friends whenever we spoke of our dream. We felt the same as Nicole Kidman and Tom Cruise in the film ‚Far and Away‘ who had a dream of a property in America, which seemed far away and out of reach. This movie encouraged us through the years, to not give up on our dream, especially when we returned unsuccessfully from our search somewhere in Germany. You are perhaps familiar with the feeling: you dream of a certain goal, a particular place of work, a place to live or a home, or a partner – and this goal seems out of reach. Despite all attempts it remains a dream. Then doubts come. Is my dream unrealistic, is my dream too big? Or does an invisible power prevent my dream from coming true? Over the past six years Ilona and I have searched intensively for a suitable property. We have looked at all sorts of properties; such as – an old nouveau villa on the Lahn River to an abandoned monastery on the edge of the Eiffel. During this time we felt like two settlers sitting on a covered wagon, ready to take a new land, filled with a mixture of adventure and a longing to finally arrive at the destination. Three years ago, we were just about to settle down and live our dream: a country hotel, idyllically situated on the edge of the forest in front of it a lake. All traffic lights were green. 42 authorities were involved, water and nature conservation agreed. Then on the last day of the approval phase came the rejection by the Upper Forest Authority. A planning mistake of the municipality. Back to square one. The project had died after one year of preparation. A friend told us of the cheetah who only has three chances to kill his prey. If he does not succeed with the third attempt, his strength is not enough to survive. I do not know if this story is true, but it gave us food for thought. In any case, we were profoundly exhausted and frustrated. Once again our lifelong dream had burst like a balloon. And we were on the edge of giving up our picture of the country estate. If it were not for the two dreams I dreamt, remembering clearly every detail in the morning upon waking up! They aroused once again the longing in me and I felt strongly to not let go of our lifelong dream! Independently of each other, we were both reminded of the already mentioned film; ‚Far and Away‘ – and we made an important decision: Let us sew a large green flag which would remind us of our dream! Said and done. Since then, this symbol stands right beside our old buffet in our living room. Maybe you now consider me a weirdo – no problem, I can live with that. However this green flag has always reminded me of our common dream. In addition, this flag has accompanied us on our search for real estate. Ilona and I have always placed it on the back seat of our car and used it as an indicator when it came to the inspection of the property: Is that really the ground where we want to realize our lifelong dream in the coming years? You may laugh. At a variety of properties we have put the flag back into the car: No that’s not it! In January 2016, the situation suddenly came to a head: I felt within me a deep pain that reminded me of my own childlessness. I realized that we had been searching already for six years without success. Quite openly, I gave myself an inner ultimatum: Either it works this year – the seventh year of our search – or I let the dream of a country estate go completely. You can imagine, my wife was not at all enthusiastic about this ultimatum, but I felt that this eternal search was threatening to tear me apart internally. In April, things were beginning to fall into place. Ilona and I both felt we should stay in the heart of Germany. We had however, been looking as far as Belgium in the west all the way to the Austrian border, south east. A look at Wikipedia: Where is the heart of Germany? To our surprise: it was south of Kassel and not, as we thought, in Limburg! Two days later the telephone call with Michael Kugel, a long standing colleague in the German Knigge Council: ‚How about a historic country estate south of Kassel?‘ We looked at the expose and were gripped to the core. On the 20th of April, we visited the estate for the first time, stepped out of the car, and knew within minutes: This is it! We were astonished to hear that the German Foundation of Monument Protection had already restored everything with great attention to detail over the last six years. While we had been on our intense six years search, one of the biggest country estates in Hesse was being restored at the same time. What a miracle of God – I still get goosebumps thinking about it! The Foundation had the idea of transforming the entire estate into an event centre and has implemented this vision – without knowing for whom. For our dream it was perfect! Right from the start, during our first visit in the evening, it was clear to everyone involved how well we matched: place and vision, dream and reality! But not only that: the buildings and the historical estate also offer everything we had dreamed of for many years. The seminars in the historical Clock House, overlooking a beautiful garden, framed by an old stone wall. Directly next to it, the Chapel, which formerly served as a combine shed. In addition a pond surrounded by old trees. And a guest house which is being built in place of the former old sheep stable which burnt down many years ago. 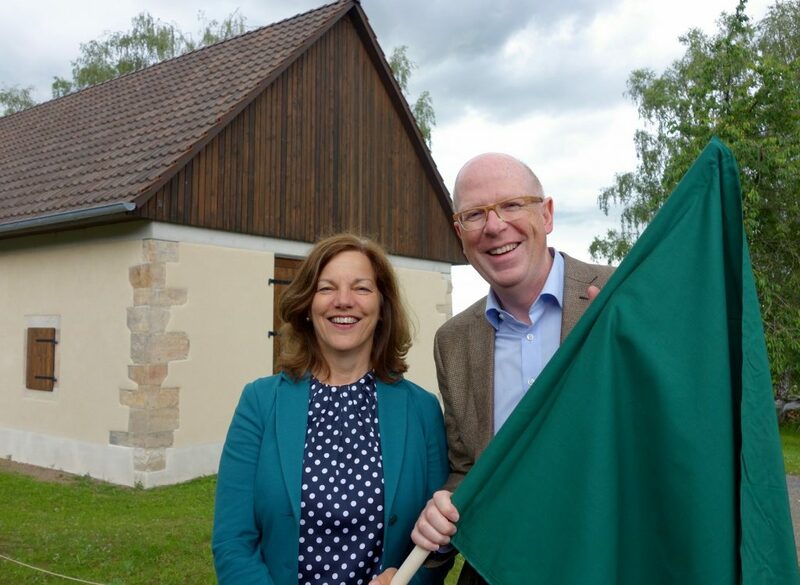 You can already guess how the story unfolds with our green flag: In the historic country estate in the heart of Germany, it has now found its place. After many years our longing can finally anchor. Welcome to the new home!